Team Honda (from left): Carl Pulley, Honda Technical PR in Torrance, California; Chuck Schifsky, Cross Brands Manager (Acura & Honda); Chris Naughton, Northeast Region PR; and Sara Pines, Southeast Region PR. 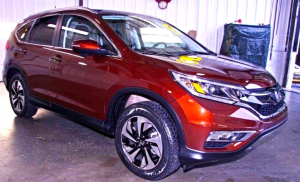 On September 30, the day before the ambitiously refreshed King of the Compact SUVs hit dealer showrooms, Honda brought a 2015 CR-V to Automotion HQ to introduce it to NEMPA. Neither the weather nor the traffic, both of which had turned nasty on Boston’s ring roads, discouraged members, who came to see the new Honda and also Automotion boss John Lawlor, who now has a leg to stand on, thanks to recent knee replacement. Honda had intended to have a trio of the new CR-Vs on hand, two for NEMPA members to drive and one to be the presentation piece. However, the two drivers had to be diverted to Detroit at the last minute, leaving just the display vehicle, a handsome Copper Sunset Pearl example in Touring trim. It got a lot of attention. It was a dark and stormy night . . . but all was serene inside the Automotion garage. Chris Naughton, Honda’s Northeast Region PR Manager and a long-time FONEMPA, put the program together. 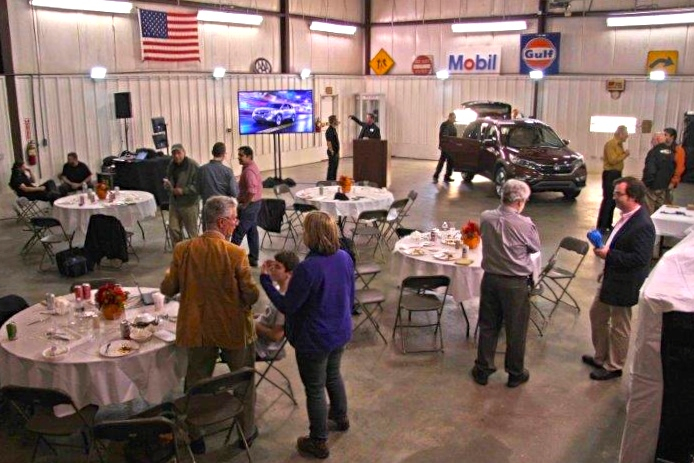 He was joined by Southeast Regional Manager Sara Pines, Carl Pulley of the Technical PR Group, and Chuck Schifsky, Manager of Cross Brands (Acura & Honda). They have much to celebrate. The CR-V, now in its 17th year, has been America’s top-selling SUV in seven of the past 10 years, and this year it’s been selling at a faster pace than in 2013. So why such a sweeping refresh in mid-cycle? Simple: “Because the competition is so stiff in this segment,” said Naughton. 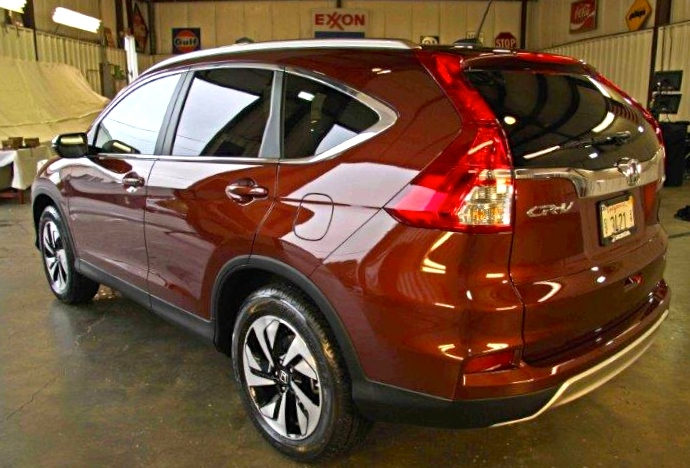 For 2015, the CR-V gets a new engine, transmission and features along with a reinforced undercarriage and styling upgrades inside and out. While the changes are significant at every trim level, Honda has added a slew of new safety and driver-assist technology to the Touring edition. An AWD 2015 CR-V Touring starts at $33,530, including destination, about $2,000 more than the next model down, the EX-L with navigation. Although the designations have changed, the number of CR-V configurations hasn’t: LX, EX, EX-L, EX-L w/Navigation and Touring. Each of the five is available with front-wheel or all-wheel drive. The 2015 Touring buyer gets—among other things—CMBS, FCW, LDW, LKAS and ACC. That is, the Collision Mitigation Braking System, Forward Collision Warning, Lane Departure Warning, Lane Keeping Assist System and Adaptive Cruise Control. All are new to the Honda lineup. 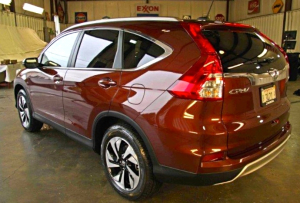 Along with more powerful yet more fuel-efficient, safer, quieter and more comfortable, the all-new 2015 CR-V is sleeker and looks more sophisticated. Up front, the CR-V grille is shorter but wider than before, and it sweeps laterally through the headlights into the fenders. The headlights themselves get fancier as trim levels go up, with LED running lights on the EX and above and multi-reflector projector units on the Touring. At the rear are slightly restyled taillights, a horizontal chrome garnish bar and an available power liftgate. On the 60/40-fold rear seats, hit a lever on either side of the cargo bay and the seat cushion on that side flips up, the headrest folds down, and the seatback falls forward to create a flat surface. It’s all mechanical (no motors), and each seat is easy to flip back into place one-handed. Rear passengers get heating/cooling ducts behind the center console. The console has a new look, with a sliding armrest that covers power outlets (12 volt, USB and HDMI) and is slotted for wires. The cupholder has a pair of partitions so it can be configured to hold most any drink. The upscale new cabin is quite handsome, and the thickness of the door seals has been doubled and the insulation under the carpeting has been improved to make it quieter. Underneath, Honda has stiffened the CR-V’s chassis and tweaked its crumple zones with an eye to earning the top NHTSA and IIHS crash-test ratings. The refreshed CR-V powertrain is rated for a significant boost in fuel economy. A new 2.4-liter four-cylinder engine, standard on all trims, produces 185 horsepower and 181 lb-ft of torque (an 11 percent increase). It’s mated to a new CV transmission with 33 percent greater gear range than the five-speed automatic it replaces. Fuel economy ratings are now 27 city/34 highway/29 combined for FWD versions and 26/33/28 for AWD. Honda says the new transmission won’t have the buzzy, rubber-band feel of other CVTs. At the rear are slightly restyled taillights, a horizontal chrome garnish bar and an available power liftgate. Connectivity also is updated with a seven-inch screen that responds to tablet-like touch-swipe-pinch commands. There’s also a quartet of Honda-specific apps available to download and an interface for iPhone owners to make voice commands via Apple’s Siri voice recognition. Pines and Naughton expect to be back soon. Honda will launch a significantly smaller crossover ute, the HR-V, based on the subcompact Fit, this winter. Meanwhile, we look forward to welcoming a new CR-V to our test fleet.